A visit to the dentist can be a stressful, even frightening experience to some adults. If the patient who needed to have their teeth checked was a young kid, they may be even more scared. The sound of the drill and the alien-looking tools used in the dentist’s office can send awful and scary ideas to a child. This will make things more difficult for the dentist as the kid will tend to be more apprehensive when it comes to getting their teeth checked. First Child Dentistry Tip is to get the parents involved and introduce dental hygiene to the child early on. Teach them how to properly brush their teeth, how to carefully floss and rinse their mouths. Parents should also take the kid to the dentist’s office when going in for a checkup or procedure. This is so that the child becomes familiar and comfortable with the surroundings of a dentist’s office. It will also reduce any anxiety they may have a more accepting and relaxed state if they see you in a happy disposition and that there’s nothing to be worried about visiting the dentist. Second child dentistry tip is to ensure that the surroundings of the dentist’s office resemble a home or have play areas. Cold plain white walls and quiet waiting rooms are not conducive to relaxation. Add color and introduce entertainment into the office. This allows the child to have fun at the office instead of worrying about any treatment. 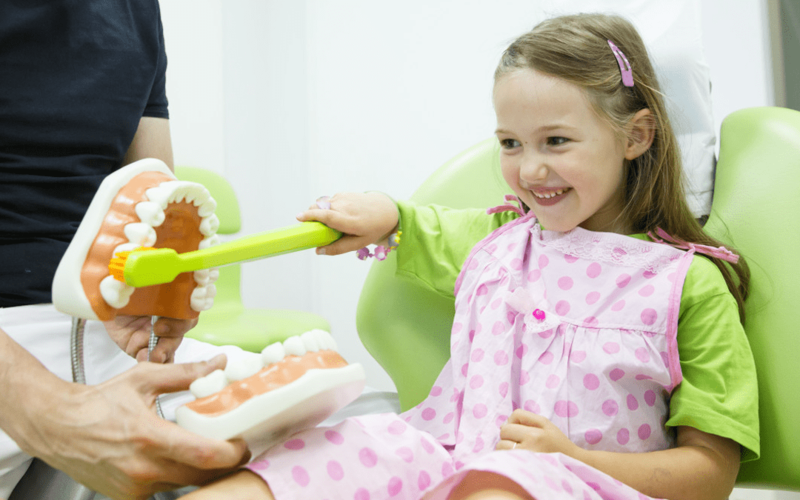 A warm and light atmosphere in the dentist’s office is important and allows the child to be less tense. The third dentistry tip is to constantly communicate with the child. Talk to the kid by sharing stories and explaining the procedure in a way they can easily understand. Kids become afraid because they don’t know what you’re doing in their mouth, explain to them what you are doing and reinforce their cooperation by giving them verbal praises and positive reinforcement. This method will help you gain the child’s trust faster and easier. There are many child-friendly dentists out there. Contact Academy Dental and get to know the dentists so you and your child will have a stress free checkup from now on.